Major Enhancement: Audio Capture Engine (ACE) has been updated to 10.0.1, for the most robust and reliable audio capture. Bug Fix: The Menu Bar Meters block will now work as expected, with meters coming and going correctly. Bug Fix: Several issues with audio playback in the Recordings tab have been corrected, including proper playback of high sample rate files, lower CPU usage, fixed memory leaks and a crash avoided. Bug Fix: The Control menu no longer incorrectly displays both portions of a toggle option at the same time, and the menu items now work regardless of the Session window's selection state. Bug Fix: A small improvement was made to the audio resampler. Bug Fix: A rare problem with writing certain ALAC files has been corrected. Bug Fix: A very rare crash sometimes triggered by splitting then stopping a recording is no more. It has ceased to be.Bug Fix: Many other minor improvements and refinements have been made. Major Enhancement: Audio Capture Engine (ACE) has been updated to 9.1.4, with improvements to audio capture of OBS and Twitch, as well as other small fixes. Bug Fix: The interface now updates correctly in all cases when hotkeys for Time Shift block are used. Enhancement: The display of audio devices has been improved, now avoiding unnecessarily repetitive names. Enhancement: The 10 Band EQ has been improved, with markings that are accurate across all input sample rates, as well as reduced frequency rolloff. Enhancement: Several minor improvements and optimizations have been made to file playback in the Recordings tab. Enhancement: Improvements have been made to the Broadcast blocks track title system. Bug Fix: The interface now updates correctly in all cases when hotkeys for Time Shift block are used..
Bug Fix: Audio playback in the Recordings tab once again properly uses the selected output device's default stereo pair, fixing a regression. Bug Fix: A small improvement has been made to logging for timed recordings. Bug Fix: An issue where the Recordings tab was erroneously referred to as the “Recordings Bin” has been fixed. Other: The support form in Audio Hijack's Help menu has been updated. Other: The order of recording formats in the Recorder block has been adjusted, placing AAC at the top, and moving AIFF to the bottom along with WAV. Major Enhancement: Audio Capture Engine (ACE) has been updated to 9.1.2, with MacOS 10.14 (Mojave) compatibility and a fix for capturing audio from Voice Memos and other ports from iOS to Mac (“Marzipan” apps). Enhancement: Backend changes have been made to many small pieces of Audio Hijack, which should improve its longevity. .
Bug Fix: Audio Hijack now better handles error reporting when attempting to capture from apps which require the ACE extra. Bug Fix: VoiceOver has been updated to work around a change Apple made on MacOS 10.14. Menu items will again properly reflect the most recent action taken. Bug Fix: Option-return now correctly places a newline in the Comments field when editing tags in the Recordings tab. Bug Fix: A cosmetic issue which could occur when restoring or duplicating blocks has been corrected. Other: Audio Hijack now requires MacOS 10.11 (El Capitan) or higher. If you're still on 10.10 (or lower), be sure to see our Legacy page. Major Enhancement: Audio Capture Engine (ACE) has been updated to 9.1.1, with MacOS 10.14 (Mojave) compatibility. Major Enhancement: Audio Hijack now has full VoIP capture support for “Linphone”. Enhancement: Changes made by Spotify have led to ACE being required to capture audio from the Spotify app. Audio Hijack now alerts the user to this requirement when necessary. Enhancement: Several small VoiceOver refinements have been made. Bug Fix: Some fields incorrectly allowed line breaks. Now, they do not. Bug Fix: Small corrections have been made for UI issues when blocks are off, and other minor interface tweaks have been made. As well, CPU usage has been improved when moving blocks within a session. Other: Audio Hijack now has compatibility with MacOS 10.14 (Mojave). Other: Audio Hijack now requires MacOS 10.11 (El Capitan) or higher. Enhancement: “Sample rates for high bitrate MP3 recording have been refined, with incorrect low sample rates removed. Major Enhancement: The Broadcast block now offers presets for MP3 and AAC streaming, as well as fully customizable setups via the powerful new advanced encoding options. Critical Bug Fix: Block presets will again save for all relevant blocks and all users. Enhancement: Various interface improvements have been made, including properly Retina-izing the tag icon seen in the Broadcast block's popover. Bug Fix: A rare issue where crackly AAC streaming could occur due to sample rate issues has been corrected. Major Enhancement: When a server issue occurs after the successful start of a stream, the Broadcast block will re-try its connection for up to 10 minutes. Critical Bug Fix: Several misbehaviors in the Switch block have been corrected. Bug Fix: Station logos are now properly saved in presets. Other: Improvements have been made to various error messages. Critical Bug Fix: The Broadcast block now properly sends track titles to all server types, including Shoutcast 1. Critical Bug Fix: The Broadcast block's support for Icecast 2 servers has been adjusted and improved, to work better with hosts including Spreaker.com, Live 365, and more. Enhancement: A default station name is now provided by the Broadcast block, based on the logged-in user's name. Enhancement: The Broadcast block's “Track Titles” source can now be reset, by selecting the “No Source” option. Enhancement: When album artwork data is available, the Broadcast block now properly sends it to Shoutcast 2 servers. Shoutcast 1 and Icecast 2 servers don't support album artwork. Bug Fix: The Input Switch block is now correctly initialized with the “A” source active. Bug Fix: The “Host Name” field in the Broadcast block has been renamed to “Server Address”, to reduce confusion. Bug Fix: The Broadcast block's Station Logo field is now hidden when not streaming to a Shoutcast 2 server, as other server types don't support receiving station artwork. Other: A separate “Broadcast” log has been added to Audio Hijack's Debugging window. Other: Due to issues with problematic servers, the Broadcast block's “Auto Detect” option for Server Type has been removed. Existing setups will be switched to a fixed server type; users should verify this change. Major Enhancement: Audio Hijack also has a new Input Switch block, which allows you to toggle between two different audio sources with a quick click. Enhancement: The Template Chooser now includes a new “Internet Radio” template, perfect for getting started broadcasting audio with Audio Hijack. Major Enhancement: Audio Capture Engine (ACE) has been updated to 9.0.2, to fix several small issues related to installation. Enhancement: Audio Hijack now works around device visibility issues caused by incorrect behavior seen in apps such Boom. Enhancement: Audio Hijack's MP3 encoder (LAME) has been updated to version 3.100. Bug Fix: The Preferences window has been updated for improved VoiceOver compatibility. Other: A second update to License window has been made. Major Enhancement: Audio Capture Engine (ACE) is the new name for Rogue Amoeba's audio capture backend (formerly called “Instant On”). ACE has been updated to version 9.0, with several small fixes and improvements. Enhancement: VoIP support for GoToMeeting has been updated to support all versions, including new versions from LogMeIn. 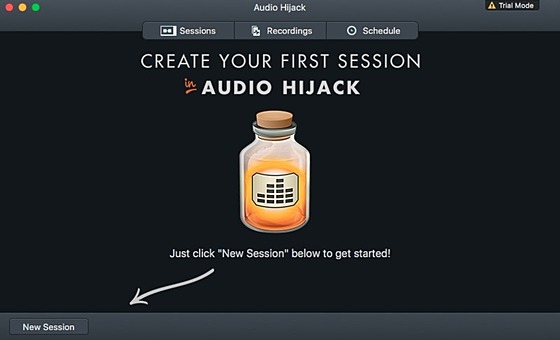 Enhancement: Improvements have been made to Audio Hijack's FLAC recording. Major Enhancement: Instant On has been updated to version 8.4.5, with important compatibility fixes for Skype 8, along with other small fixes. 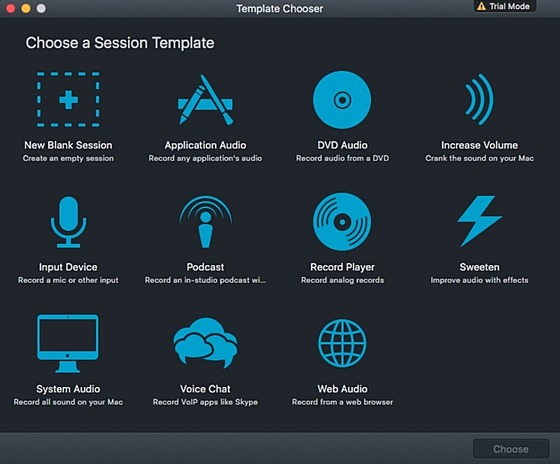 Audio Hijack now has full VoIP capture support for Scopia Desktop and LINE. Critical Bug Fix: Application audio capture will now always occur at the correct sample rate, rather than incorrectly defaulting to 44.1 kHz. Bug Fix: Audio Hijack's updated audio capture engine now works as expected with single-site browser (SSB) apps such as those made by Epichrome. Bug Fix: The “Limit Audio Capture To” option in the Application Source block now behaves as expected for all apps, including VoIP apps. Bug Fix: A rare crash which could occur when deleting an active Recorder block has now been corrected. Bug Fix: The minimum sample rate for 320 kbps AAC has been corrected to match AAC specifications. Bug Fix: Audio Hijack can once again launch Plex Media Player as expected. Bug Fix: Audio capture now works as expected when a device with very high sample rates (above 192 kHz) is in use. Bug Fix: Audio playback with single-channel devices has been corrected to properly provide both channels. Other: Audio Hijack now has full compatibility with MacOS 10.13 (High Sierra).